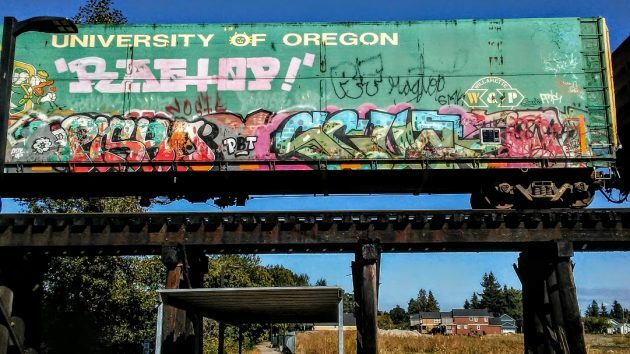 If memory serves, these woodchip hopper rail cars got their new paint schemes — honoring the Oregon Ducks and the anti-drug DARE program — in about 2000 or before. And look at the colorful messes created by taggers in all the years since. The cars bear the markings, if you can see them, of the Willamette & Pacific Railroad, which was merged into its sister company, the Portland and Western (PNWR), in late 2000. The railroad gave three cars a special paint treatment. The third (last seen on hh-today this past July 14) honored the Oregon State Beavers and like the other two has been thoroughly defaced. 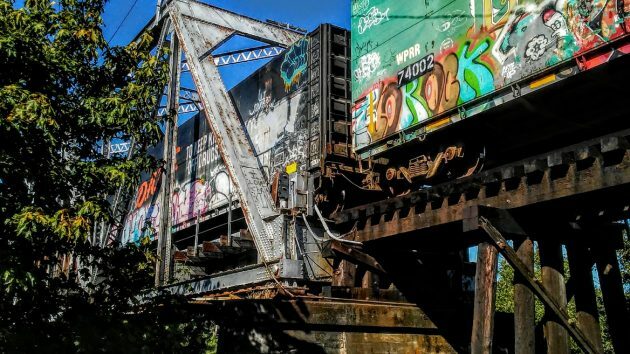 I was on the riverside Dave Clark Path last week when an eight-car train of the PNWR stopped above me after crossing the Willamette River on the 1921 Albany rail bridge. The UofO and DARE hoppers were in the middle. These cars are a familiar sight all over the railroad’s Oregon system, and they’ve been photographed many times. And so, last week it looked like this. And pray tell just what “right” do these taggers have to deface someone else’s property??!! They would howl to the heavens should a R/R employee go by their place & paint their car/house/etc. That IS NOT art by any stretch of the imagination & to appease them with any kind of recognition just emboldens them. You think it’s art then give them you address so they can come by & decorate YOUR house! And, I thought I was too opinionated and too hot tempered. Calm down. I’m sure the railroads have plenty of other things to think about other than the paint on their train cars. HASSO, i THINK THEY ARE TEARING DOWN THE OLD ALBANY OPERA HOUSE AT 222 e FIRST. Russ, that’s the Spruce apartments. The Lepmans are renovating the building. It’s not art; it’s vandalism. HH knows that. He isn’t conferring recognition, just providing a glimpse of valley life, albeit a destructive part of valley life. It’s not always pretty but it’s real life. I am not a big fan of vandalism but the Duck train actually looks better afterwards. From an artistic point of view, you gotta give a BIG thumbs up to the tagged version of the Oregon Ducks cattle car. The original looks like it was conceived by the Accounting Department. It is unfortunate that so few comprehend the artistic merit obvious in the “tagged” chariot. The Beaver and Duck cars were unmarked for many years. The interstate cars were a mess long before locals picked up tagging. Interesting to have seen Waterbed Lou and similar era chalk/crayon monikers such as Bozo Texino, Colossus of Roads, Rambler, and Herby, pass through Albany. Amen. I believe that one of our really, really old Supreme Court Justices said that a persons “RIGHTS” stop just before someone else nose gets hit. The use of the word “RIGHTS” has become overused as a means to obtain what a few persons want, not necessary for the betterment of the majority.